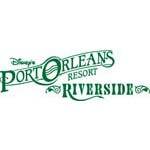 Disney's Port Orleans Resort – Riverside was inspired by rural Louisiana and is nestled alongside the picturesque Sassagoula River. You'll feel welcomed back to a time and place where everything seems to move a little slower and simple pleasures flourish like magnolia blossoms in the springtime. Be surrounded by the tranquility of the Louisiana Bayou as you enjoy the hospitality of a picturesque waterfront Resort hotel that embodies the traditions born of steamboat travel, formal garden parties, and mint juleps on the front porch.